Not sure which hair styling product to use for your hairstyle? Don't worry, TheHairStyler.com has your questions covered! Styling your hair can be one of the best parts of any beauty regime. There's nothing better than stepping out of the house knowing you look fabulous and that you achieved the look yourself. While mastering a signature do can take time, it's well worth the effort and can easily be achieved with the help of the amazing range of products on shelves today. Hair styling products are an essential part of any hairstyle and can make the difference between your hairdo lasting all day and night, or flopping before you get out the door! Products that contain silicone will temporarily smooth your locks and add shine to your hair. Handle any styling wax with warm hands to make the product easier to control and use. The most important hair products to use are shampoo, conditioner, a heat protector and a finishing product. Use serums, glosses and waxes in blonde hair whenever styling products are necessary as they won’t dull the color like matt-effect products. Use the right product for your hair type. For more info, see our hair care article, The Best Hair Products for Your Hair. If you suffer from dry or damaged hair try to avoid any hair styling products that are spirit based as they can cause further dryness. For shine without the thickness of a serum, use shine gloss. It’s sprayed into your hair just like hairspray and will give you glossy locks without the weight. For a natural look, use light hair styling products that are sprayed on instead of products that require you to coat your hair strands. If you have fine or oily hair make sure to add any silicone products just to your ends to avoid an oil overload. If you’re applying styling products after washing your hair then always make sure your hair is only slightly damp to receive the full benefits of the products. When applying hair styling products you should always start with the smallest amount possible and then add more if needed. Wax can be used to add shine to your hair if applied evenly and lightly. To avoid ruining your style with too much product, start where you have the most hair at the back of your head and then move to your front section of hair. To keep static strands at bay, spritz your hair brush with some hairspray and then brush through your locks. Using leave in conditioner is a great way to care for your curls and transform them into manageable ringlets. Just apply to damp hair and twist your curls into shape. Always match your styling products to your hairstyle. If you’re going for super straight locks then use straightening cream. After a mass of curls or textured waves? Try frizz reducing products and curl boosters. Use wax and gel products for hairstyles that require definition. They're great for twisting curls into shape, creating dreadlocks, or achieving a choppy look by piecing straight sections of your hair together. To keep an upstyle in place, hold a can of hairspray at arm’s length and then circle your hair three times for 10 seconds at a time. Try to set very curly hair when it’s wet for a better result but make sure your hair isn’t dripping wet (gently blot with a towel to remove excess water) so your hair styling products can set firmly. Never apply gel and then blow-dry your hair or you’ll end up with a flaky residue. Whether your bathroom cupboard is full of the latest and greatest products, or you've only just started to build up a collection, these tips about specific hair products, how to use them in your hair, and what works best with certain hairstyles are sure to help you out! To help you sort through the hairstyling product maze, THS has put together a glossary of the styling products you'll need to pull off any fabulous look. Description: a foamy, lightweight product. Hold strength: 6 out of 10. Uses: gives hair body, bounce and volume. Reduces static. Great for: curly hair, fine hair and limp hair that needs lift. 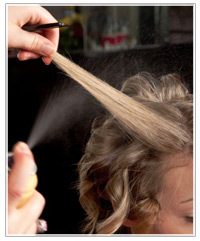 A small amount when blow-drying will give the hair volume and a soft hold. Mousse can leave the hair sticky and crunchy if not dried with a blow-dryer or if too much is used. Description: a clear, heavy, goop-like substance. Hold strength: 10 out of 10. Uses: is great for making hair texture messy, holding spiky hair in place and keeping short hair flicked out. Great for: contouring short hair and taming fly-away locks. Gel will add definition to short curls and is not recommended for fine or flat hair as it will weigh it down. Using too much gel can be lethal for your look and too little will be less effective. Roughly around a tablespoon of product is all that is needed. To re-active gel, mist your hair with a little water and scrunch again. Description: Looks like a gel, yet styles like wax. Hold strength: 5 out of 10. Uses: gives hair a soft and messy look without making it rock-hard. Great for: shorter hair and will benefit longer styles that need volume, body, and hold without being weighed down. To get the best from gel wax, warm it in your hands before applying and make sure to spread it evenly. Description: very similar to hairspray, but has less hold. Hold strength: 8 out of 10. Uses: gel spray will hold hair into place without leaving a white residue or a rock-hard finish. Great for: up-styling as it will still allow movement throughout the hair. Shorter, messier styles will hold well with gel spray and will not look wet or be weighed down. Mist throughout your hair lightly as a finishing tool once your style is complete. Description: a milky-like gum substance that smoothes into a paste. Hold strength: 2 out of 10. Uses: wax works best on messy hair and is great for achieving flicks and defining layered hair. Great for: smoothing and twisting short locks into place and separating hair strands. Rubbing wax between your palms to warm it up will make it easier to work with. Wax can look and feel greasy on long hairstyles, so go easy. Description: a clear-like gel that is runny in texture. Hold strength: 5.5 out of 10. Uses: can be used as an alternative to mousse for curly hair or as a styling aid when blow-drying. Great for: adding waves to straight hair. A tablespoon of sculpture lotion is enough to create a soft natural curl or body to fine hair when blow-drying. Description: an oily liquid substance that is mainly used to give shine. Hold strength: 1 out of 10. Uses: can be used in any hair type to add gloss. Reduces static. Great for: any hair type and style but is especially good for smoothing down frizzy hair. Only a small amount is required as too much product will give an oily residue and make hair look like it hasn't been washed. Description: comes in a can and is sprayed directly onto the hair for hold. Uses: can be used as an alternative to gel spray and keeps a strong hold all day long. Great for: curly hair, upstyles, messy hair and flicked hair. Spray hairspray at an arm-length distance and don't use too much or you will end up with a white, flaky residue which looks like dandruff. Description: creamy or oily in texture. Uses: tames frizz, smoothes strands and gives moisture to dry locks. Great for: curly and wavy hair textures, or hair that is prone to dryness. Apply after washing, conditioning and drying hair for an extra moisture boost. Use during styling to keep your strands smooth and nourished. Description: a spray product that is stronger than hairspray. Uses: can be used in any hair type for a strong, rock-hard hold. Great for: styles that need an extremely strong hold. Only a small amount of lacquer is needed and should be sprayed at an arm-length distance. Description: an alternative to wax that has less of a glossy finish. Uses: moulding cream is perfect for creating soft curls, flicks, waves and soft up-styles without weighing the hair down. Great for: defining layers and hair length. Warm a teaspoon amount in your hands for an even finish. Description: runny, often clear, styling product. Uses: prepares your hair for straight styles using styling tools, and helps to enhance naturally straight hair. Great for: keeping your locks smooth and frizz free while straightening with an iron or blow-dryer. Will also help to speed up styling times when using heated styling tools to get a straight look. Start with a small amount of product and only add more if needed. Work it through the underneath and end sections of your hair, where it’s likely the product is needed the most.